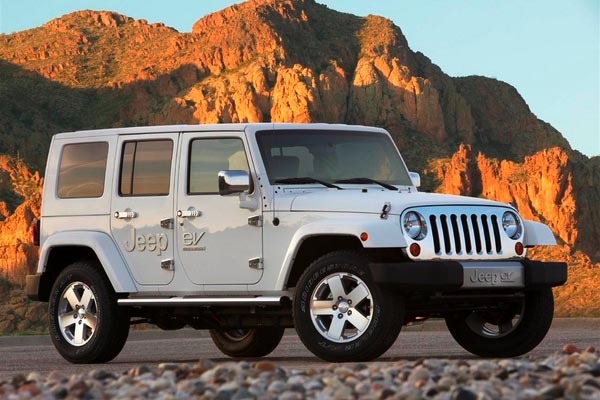 Unlike Jeep's sporty 2008 two-seater electric Jeep Renegade Concept (see Jeep Designers at Work) the Jeep EV development vehicle was an attempt to make an eco-friendly version of the existing Wrangler. The four-door Jeep EV can travel 40 miles using only its electric motor and lithium-ion batteries slung under the floor, after charging from a 110 or 220V outlet. A small gasoline engine with an integrated electric generator produces the additional energy needed to power the electric motor for 400 miles on a tankful of gas, with speeds up to 90 mph. The instant 295 lbs.-ft. of torque from the electric-drive motor will be useful in off-roading, but the initial concept vehicle may not yet be fully trail-ready. Return to the Pictorial History of the Universal Jeep or the Universal Jeep Timeline, 1942-1986.